Check out this website: http://thehomeschoolplanner.com for more info, and a free preview of their printable homeschool planner. The Printable Homeschool Planner is a great tool for you to use when planning out your homeschool year. Heather Bixler has been homeschooling since January 2006 and knows that organization is key to a successful homeschooling experience. With this printable homeschool planner you have control over how you want your homeschool planner to look. All forms provided in the homeschool planner are only branded with copyright information at the bottom of every page, and we do request that you only use the forms provided for your personal use. I've been reading and reading and reading some more. Working on new reviews to come soon - this week, I hope. Since School ends Wednesday morning for my little ones, I expect to be busy this week, but will make time to write and post reviews as I get them done. A favor from my friends? I have a small favor to ask all my wonderful blogging friends. Blogging 4 Books (who I review for) has a rating system for reviews, and as of today I have no ratings. I would love if you could help me out. Would you take a moment to read and rate my reviews for me? AND ~ if you also review for Blogging for Books - comment below and I'll gladly vote for you as well! The stranger’s cloak had fallen back, and with it, a long, white, blood-stained wing. When Melaia, a young priestess, witnesses the gruesome murder of a stranger in the temple courtyard, age-old legends recited in song suddenly come to life. She discovers wings on the stranger, and the murderer takes the shape of both a hawk and a man. Angels. Shape-shifters. Myths and stories—until now. Melaia finds herself in the middle of a blood feud between two immortal brothers who destroyed the stairway to heaven, stranding angels in the earthly realm. When the feud turns violent and Melaia becomes a target, she finds refuge with a band of angels attempting to restore the stairway. But the restoration is impossible without the repayment of an ancient debt—the “breath of angel, blood of man,” a payment that involves Melaia’s heart, soul, and destiny. Melaia is a 16 year old girl who is training to become High Priestess. Her life is simple and sheltered at the temple with the other young priestess in training. She is satisfied with her role, until the day a stranger arrives at the temple and she witnesses his murder by a hawk. Or so she thought . . . until the hawk turns into a man. 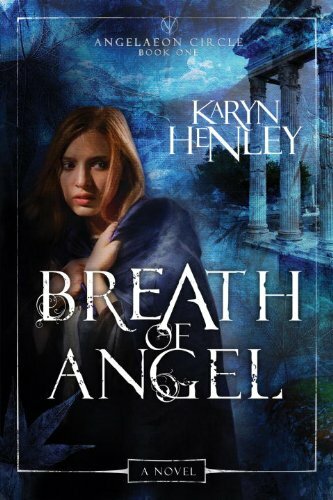 “Breath of Angel” is a coming of age type story mixed with the struggle between good and evil. Melaia is mixed up in the middle, even more than she can possibly imagine. Her High Priestess tells her to stay out of the affairs of Angels, but somehow she finds herself so deeply involved in their struggle with the malevolent angels, that her life is irrevocably changed in a matter of days. She meets both friend and foe along her journey, and begins second guessing her ability to discern which is which. This book is definitely not a “light read,” but I really enjoyed the concept, characters and struggles from beginning to end. The story left me wanting more – which is always good! Though most of the wording in the book had a nice easy flow, there are some places where I felt I needed to go back and re-read to make sure I could understand what the author was trying to say. For that reason, I give this book a 4 out of 5. I love the characters, the idea of the story line and am anxious to see what happens in the next book. Loves 2 Read: Could you tell us a little about the books you write for boys, and a bit about your background? Max: I grew up hating to read. My father wrote over 70 books and I didn’t read any of them. He also ran a film production studio where they made a lot of dramatic films. I often hung around the studio to watch the actors do their work. It was during this time that I learned about story, pacing, plot, dialog, humor, drama, and timing. When it came time to begin writing, I found that these elements were firmly imbedded in my mind. I graduated from college with a degree in psychology, was drafted into the army for two years, during the Vietnam era, and returned home to film production work after that. Film projects have taken me all around the world and across the US, Canada, and South America. Many of these experiences have provided story ideas and characters for the books I write today. I’ve written thirty-six manuscripts so far, and am writing action adventures and mysteries that I think I would have loved as a child. Loves 2 Read: Where do you get your inspiration or ideas for the characters/stories you write? Max: Many of the characters come from my somewhat wacky childhood. We always had an interesting cast of characters around us in school, the neighborhood, and church. And there was never a shortage of adventure or fun things to do. I grew up in Wolf Lake, Michigan, which was a sort of wonderland for a child growing up. We lived in a wooded area with hundreds of acres of trees. Wolf Lake was great for swimming in summer and ice skating in winter. Many of my locations for stories come from actual places where I’ve visited while shooting film and video projects. Loves 2 Read: What is the main message you want the boys to grasp in this story? Max: Sam, Tony, and Tyler took scuba lessons together. Tony’s father owned a marina, so Tony got them in for free. After the boys completed the course, they decided to try their new skills in the ocean. The only problem was, none of them had permission to go, or to take one of the sailboats out for their diving adventure. The basic message I want boys and girls to grasp is about honesty, and to know that the things you do wrong can’t be hidden forever. The book also carries a strong anti-drugs message. Loves 2 Read: Who is your favorite character, and why? Max: That’s hard to say. It’s a little like asking which of my children I like best...impossible to answer. Each character has his or her own unique traits, quirks, positive strengths and negative challenges. I truly can say that I like them all. Loves 2 Read: What do you enjoy doing when you are not writing? Max: I didn’t start writing until later in life. Because of that, the last nine years have been consumed with writing, finding an agent, locating publishing opportunities, platform building, speaking, and promoting my finished work. It hasn’t left a lot of time for much else. I’m hoping that will change before too long. I do enjoy collecting coins and stamps. I also enjoy NASCAR. My son and I go to the Daytona 500 each year. I’d love to have the opportunity to do some traveling with my wife eventually, and not have to drag a bunch of video production equipment and a crew along. Most of my travel has been work related so a change like that would be great. I Love My Mommy giveaway! Over 100 participating blogs are offering giveaways and we are all linked up together so you can easily hop from one giveaway to another. The hop runs from May 5th through May 10th. Every blog has at least a $50.00 prize with several over $100!! There are even a few packages at $250 and a grand prize package of $1500 right here at Makobi Scribe with a second place of $250. So make sure to stop by here May 5th - May 10th to sign up! Just click here ~ or on the "I love my mommy" page tab!